Boston College professor Marjorie Howes has literally written the book on William Butler Yeats. Armed with a doctorate in English literature from Princeton, the Newton resident has edited anthologies, authored a book, and contributed numerous papers to prominent literary journals focusing on the Nobel Prize-winning Irish poet and playwright. And yet, Howes had no idea that a long-forgotten pile of notebooks at her own institution, dutifully cataloged and then tucked away in a library archive, held an unpublished treasure: the first play Yeats ever wrote. Yeats wrote the play, titled “Love and Death,’’ in 1884, when he was just 18 or 19 years old. The work was hidden among boxes of his journals, notebooks, and correspondence purchased by BC in 1993 from Michael Yeats, the poet’s son. It languished in obscurity until last year, when university librarian Tom Wall formed a committee to scour the Chestnut Hill institution’s archives for “high impact’’ candidates for digitization - the process by which works on paper are photographed, transcribed, and made accessible by computer. As a result, the play will now see (digital) daylight for the first time since it was written 127 years ago. 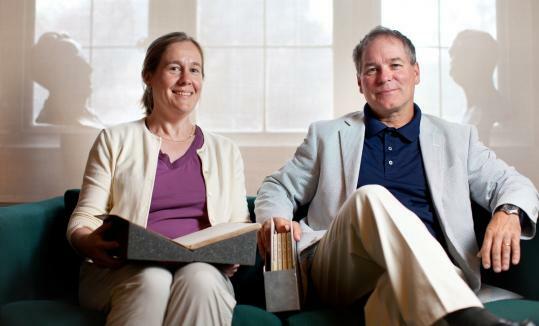 Drawing on the work of a 15-plus-person team that included librarians, archivists, photographers, literary experts, and a dedicated transcriber, Boston College this month published the play online. The project allows any would-be scholar or Yeats enthusiast with an Internet connection to leaf through the pages of “Love and Death,’’ which spans five notebooks. The hope, said Jane Morris, BC’s scholarly communication librarian, is to generate new interest and scholarship, such as graduate theses and journal articles, that will add to the body of knowledge on Yeats. Better still, research via the Internet doesn’t pose the risk of damaging the one-of-a-kind manuscript. Even as the Burns Library transitions into a new era of digital scholarship, its staff members are searching for ways to maintain the tangibility and “aura,’’ as Howes calls it, of the rare objects under their care. In order to help convey that sense of wonderment, BC’s website allows the transcribed text to be viewed side-by-side with high-resolution photographs of the original handwritten pages. “We definitely wanted to present the whole object as if you could hold it in your hands,’’ said Barbara Adams Hebard, the Burns Library’s conservator. For the lucky few at BC who have held the original work, their first concern was not damaging it. The play and the other Yeats documents acquired by BC have been carefully stored in a climate-controlled room. Manuscripts and books in the special archives can be retrieved only by librarians acting on a specific request, and must be viewed on custom-made foam blocks that prevent bindings from opening too far. But the Yeats manuscript didn’t always enjoy such careful treatment, according to digital collections librarian Betsy McKelvey. “It’s funny, the notebooks weren’t always important in Yeats’s family,’’ she said. The notebooks themselves were quite common when Yeats purchased them. The opportunity to increase scholarship while preserving fragile and rare documents is one reason BC and other institutions are moving toward digitizing their paper-based archives. Morris, who leads BC’s digitization efforts, said the Burns Library is just one of many institutions looking to store extensive holdings in a more durable and accessible format. As for the play, Howes describes it as ambitious but relatively mediocre. The twisting plot revolves around a murderous princess who falls in love with a spirit being. Dathalinn O’Dea, the graduate student who painstakingly transcribed “Love and Death,’’ will present a copy of her work during the Yeats International Summer School, which opens today and continues through Aug. 5 in Sligo, Ireland. Students there will do a dramatic reading of several scenes, said Howes, marking the first time the play has been performed in any format. Wall, the librarian who oversaw the search of Boston College’s archives, said the digitization process will continue. He hopes eventually to put 5 percent of its special collections online - an ambitious goal, considering the Burns Library’s holdings of 250,000 volumes and 16 million manuscripts. The play is available online at www.bc.edu/loveanddeath.